Poonhill trekking is an easy trek to the place nearby the beautiful lake city of Pokhara. This trekking trial never ascends to really high altitude, so it is best suited for the beginners and families including children as well. This Trek starts from Pokhara valley and takes you through the trail swings in and out of the forest of bamboos and blooming rhododendrons alive with an amazing variety of birds and flowers and traverses culturally rich villages of Gurungs (The Gurungs form the backbone of the famous Gorkha regiments) community and other ethnics in Birethanti, Tadapani, Ghorepani and other villages. 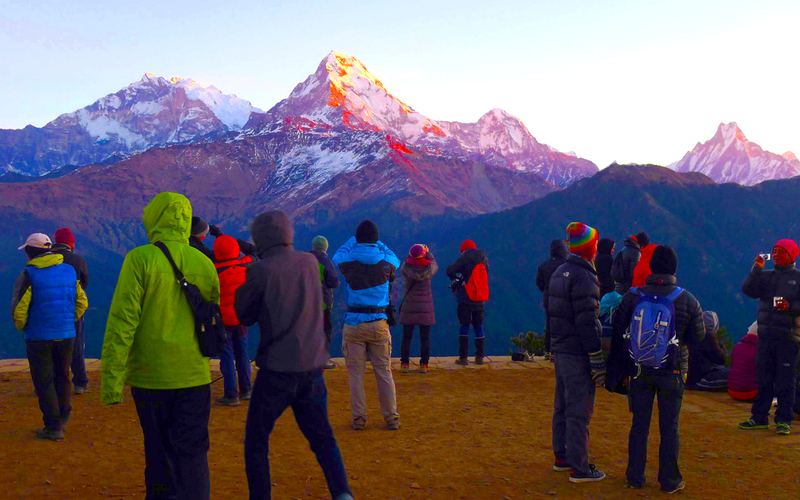 It is probably the best short trek in Nepal, which offers you a dramatic close up view of Annapurna I (8,091m), Dhaulagiri (8,167m) and Machhapuchhare-the Fish-Tail Mountain (6,997m) in their full glory. The trail swings in and out of the forest of bamboos and blooming rhododendrons and traverses culturally rich villages of Gurung and other ethnics in Birethanti, Tadapani, Ghorepani and other villages. 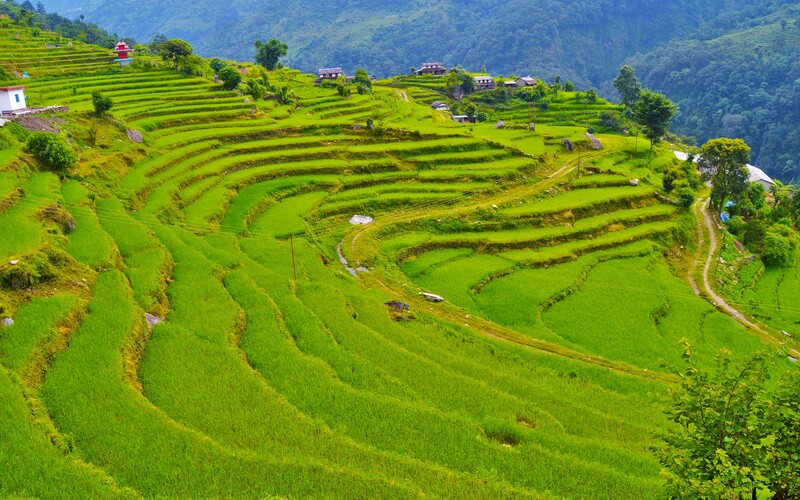 Beside Trekking, this trip also offers you the Cultural and Heritage touch of an ancient cities of Kathmandu Valley, some breath-taking spots in Pokhara and the famous Chitwan Jungle Safari. Kathmandu & Pokhara cities Tour as per the itinerary with local English speaking Guide. Including entrance fees during guided tour. Accommodation at best available Tea-houses / Guest houses during the Trek. Service of Local Trek Guide & Porters (2 trekkers:1 porter) including their salary, insurance, equipment, transfers, food and lodging. International flights, visas, other meals in cities, airport taxes, excess baggage charges, personal laundry, soft drinks, and alcoholic beverages. Extra night accommodation in Kathmandu in case of early arrival, late departure, and early return from the trek (due to any reason) than the scheduled itinerary. Expenses of emergency rescue by ambulance, helicopter, medication and hospitalization in case of illness. Upon arrival at Tribhuvan International Airport in Kathmandu, you will be received by our representative and transferred to your Hotel. The evening is free to venture around the city close to your hotel. Introduction Session at the hotel in the evening. After early breakfast, We will be transferred to the domestic airport for a scenic flight to the beautiful lake city of Pokhara. Pokhara is smaller and more relaxed place than Kathmandu and is beautifully situated on the banks of Phewa Tal (lake). This is a city of renowned Gorkha Soldiers, situated in a valley beneath the 8000 meters Annapurna Massif dominating the skyline in the northern horizon. Only foothills separate the town from the high mountains. The view of the Phewa Lake against the backdrop of perfectly shaped Machapuchere Range (the Fishtail Mountain) is the popular landmark of Pokhara. Pokhara is also the starting point of many of the major treks in Nepal. Mahendra Cave is a cave located near Pokhara, Kaski district, close to the Seti River, is the large limestone cave. It is a rare example of a cave system in Nepal containing stalagmites and stalactites.The cave attracts thousands of tourists every year. A statue of Hindu lord Shiva can be found inside the cave. Just a ten minutes walk from the Mahendra Cave, there lies another cave named the Bat Cave. As the name suggests, it is named after the bats as there is the prevalence or the habitats of the bats over the cave's wall and the ceilings. Apart from it's attraction, it is also rich in greenery as the surroundings of the cave is covered by the forest. From Bat Cave, it is about 30 minutes drive to mysterious Devis Falls. Patale Chhango "underworld waterfall" or Hell's Falls in Pokhara has accumulated many different names over the years. It is also known as Devi's Falls, David's Falls, Devin Falls and Devis Falls. The name might take on different forms, but the sight remains the same. It is an area that is known for its beauty and tranquility, it is an attraction for tourists and locals. After breakfast, we will take 90 minutes drive through Pokhara-Baglung highway passing a beautiful Lumle village towards Nayapool, from where the trek starts. Following Modi River, we will walk past forest of blooming rhododendron and cross small stream. We can stop by Birethanti for a lunch break. Then start to hike to Tirkhedhunga. Total walking 5-6 hours. The trek from Tadapani to Ghandrung is beautiful going through mixed forest regions, the trails are sometimes very high and you can see the valley down to about 400 meters. 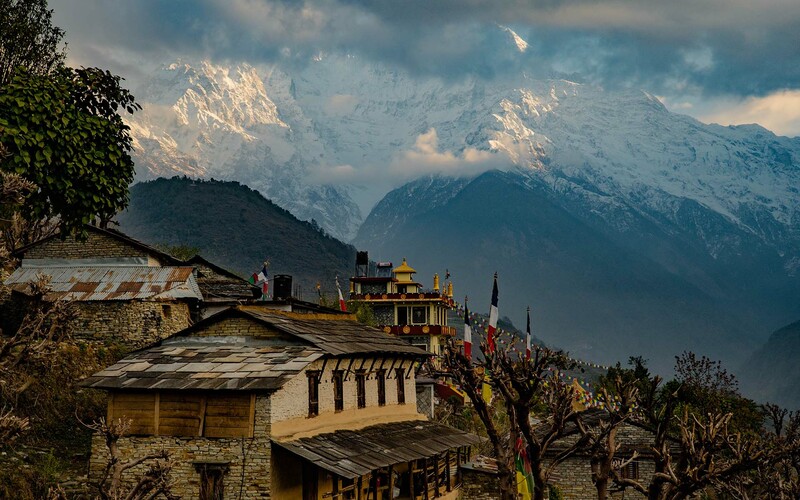 Ghandrunk is probably one of the biggest villages on the Annapurna trails. Gurung people primarily inhabit the village; many of them are ex-British Gorkha soldiers. The village is beautiful and has beautiful front views of Machapuchare and Hiunchuli. It is about 3 to 4 hours of easy walk through forest of oak, rhododendron and other alpine flowers will take us to Ghandruk. Ghandruk is the large Gurung village. 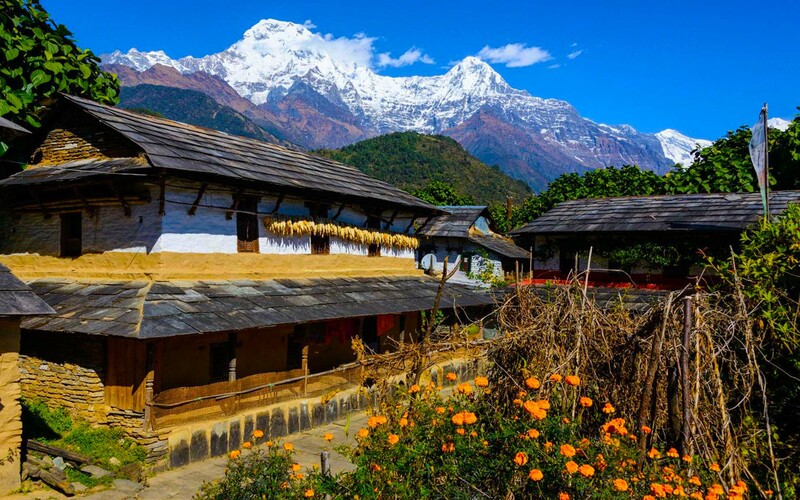 We can get striking views of Annapurna South, Gangapurna, Machhapuchhre, Annapurna III, Hiunchuli and other Mountains from viewpoint in Ghandruk. Homestay in Ghandruk is a pleasant experience. From Ghandrung, we will descend gradually through village of Sauli Bhatti, Birethanti and finally ending our walk at Nayapool where we started the famous Ghorepani Ghandruk loop trek. This part of walk will take about 4-5 hours. We will now take a drive to Pokhara. Hotel Check-In. Free Evening. After breakfast, we will take a Tourist Coach from Pokhara which usually depart at 7:30 am for Chitwan. Distance wise Pokhara is only 86 kilometers away from Chitwan, but due to the hilly road condition, it will take more time than we expect. Drive time is about 4 to 5 hours. However, it is worth noting that the view is simply breathtaking, and we get to experience the road of Nepal and drive around the mountain area for a scenic view. Jungle Activities Ends by 10:00 am and Transfer to Bharatpur Airport for a flight to Kathmandu. 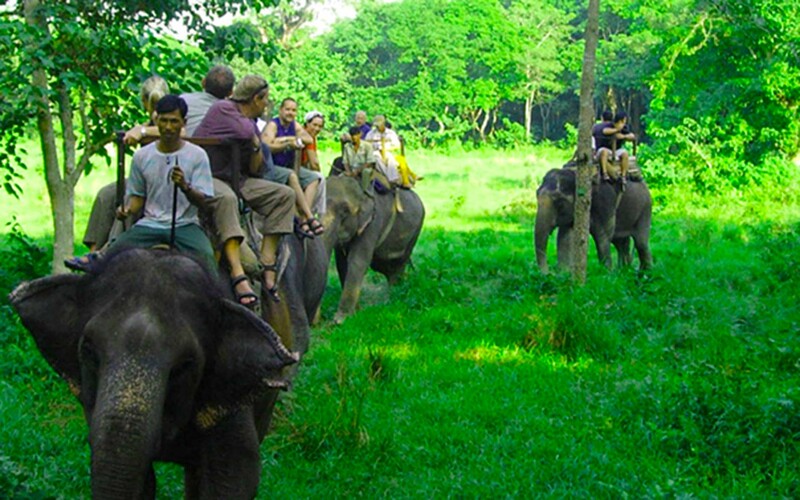 Before departing from Jungle Lodge, we may enjoy the last jungle walk and a brief visit to the Government Elephant Breeding Centre. After Breakfast, Transfer to Airport to connect with the onward flight. 3-star hotel in Kathmandu, 4-star hotel in Pokhara, Tea house Lodge during the trek & Jungle Resort.